Pour the condensed milk in a large mixing bowl and add all the above ingredients.. Mix all ingredients until they are well combined and set aside.. Line a 24cm baking tin (or similar) with parchment paper, and spoon in the granola mixture.. Use the spoon to smoothen out the surface, and bake in the oven for 35-40 minutes (until it turns golden brown).. Remove the granola from the tin, and wait about 10 minutes before you cut the slices.. Let it cool before serving so that you can enjoy the real crunch.. Enjoy! 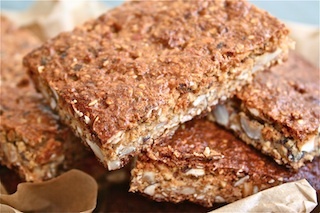 Chop up these granola bars and enjoy with milk or yoghurt and some fresh berries.. Beautiful! !